1221 N Elm Pl., Broken Arrow, OK. Doors open at 6p, play starts at 6:45p . Gold & Silver memberships allows unlimited league nights, open play nights during Jr. training sessions and discounts on tournaments..
We are non-profit, fees are used to purchase tables, club equipment, Jr. Team development, and rent. Attention: League night is open to all players! You do not need to attend every week! You can participate in accordance to your schedule. Details as to how we conduct league night are explained throughout this website.... Come join the fun! First night is free! Regular Fee Schedule Above. 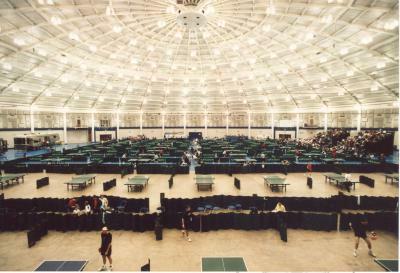 The 1st Broken Arrow Table Tennis Open had 54 entrants including 16 Juniors. You would be hard pressed to find any club tournament in the country with this amount of Jr's participating in 6 Jr. events. More later on this event. Thank you to all players who made this such a great event. This was a non-sanctioned event. Welcome to the Broken Arrow Ping Pong Club's new web site. League play on Thursday nights will have a competitive format. Participants will be assigned a rating based on skill level or use their current USATT tournament rating. All skill levels are welcome and will be matched with others at your level. You do not need to attend every week. See below as to how our rating system works. Players ratings will be updated weekly and published on this website. Game and match records will cumulatively evolve week to week and posted. When you attend, the top 4 rated players along with the table 2 winner from the previous week will compete in a Round Robin on table 1. The next 4 rated individuals and table 3 winner will be matched in a 5-person RR to battle it out on table 2. This format continues for all players. We will charge for play and use these funds for rent, and to purchase more tables and equipment. We are non-profit. Yes, we did hand out a few awards. Families who play together, stay together!!! Moms, Dads, Brothers, Sisters, Nieces, Nephews, Uncles, Aunts, Gramdmas, Grandpas . 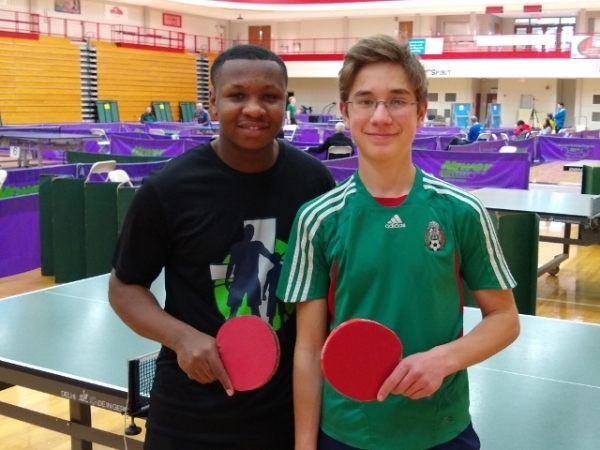 Dion Payne-Miller (left) and Marty Stoner took first and second in the 2200 event at the St. Joseph Valley Open Table Tennis Tournament. Sponsors needed for the Junior Team. 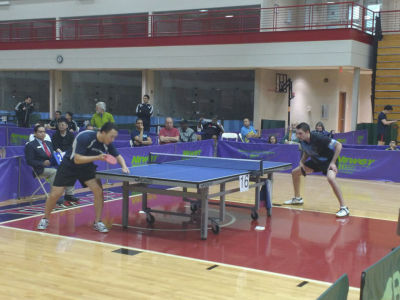 Whether you’re playing doubles or singles, table tennis, or ping pong, can be a fast-paced competitive sport. In fact, when played at an intense rate, it can be a great way to burn calories and get fit. I've added some links to some related articles below the top 10 list. Check them out. 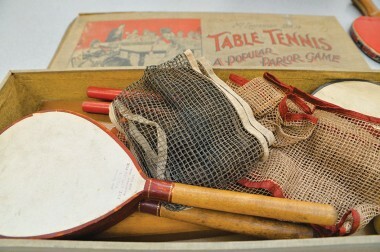 *Playing improves hand-eye coordination and it stimulates mental alertness, concentration and tactical strategy. This makes it the perfect game for young people to sharpen reflexes, and for older people to refine tactics. *Develops mental acuity. The speed, spin and placement of the ball are crucial in table tennis, and practiced players are highly skilled in both creating and solving puzzles involving these three attributes. *Improves reflexes. Due to the fast-paced, short-distance nature of the sport, both gross and fine muscle movements are improved. The game is distinguished by bursts of exertion and recovery, leading to fast-twitch muscle development. *It’s easy on the joints. Have you had knee surgery, back problems, tired of twisting your ankles? Try table tennis. It’s a great way to improve your leg, arm and core strength without overtaxing your joints. *Burns calories. A 150-pound person can burn 272 calories by playing table tennis for an hour. Considering the fact that the sport is entertaining and addictive, it can be a fun and easy way to burn calories. *Offers a social outlet. Whether you play in the community center or at home with friends, table tennis offers a great way to bond with other people while you lose weight. Because young and old people can play the game, it can help improve communication and build relationships, irrespective of age. Playing at home with siblings or parents can bring family members closer and enable them to spend more quality time with each other. *Keeps your brain sharp. Alzheimer’s Weekly reports a clear increase in motor skills and cognitive awareness from playing table tennis, after a series of preliminary clinical studies in Japan found that table tennis markedly increases the flow of blood to the brain, and could possibly even prevent dementia. *Improves coordination. Following the ping pong ball as it moves quickly toward you, and following its trajectory as your opponent hits it helps improve hand-eye coordination. *Improves balance. Staying balanced and being able to quickly change direction are key to being successful in a ping pong rally. This is especially important for the elderly. *Stimulates various different parts of the brain. By anticipating an opponent’s shot, a player uses the prefrontal cortex for strategic planning. The aerobic exercise from the physical activity of the game stimulates the hippocampus, the part of the brain that is responsible for allowing us to form and retain long-term facts and events. The BAPPC league ratings is a numericial system similar to the chess rating system. The higher your rating, the more advanced your skills. Your rating will increase or decrease based on the spread between you and your opponant. If you defeat someone with a higher rating, you will gain more points than if you were to win against a lower rated competitor. To follow is the grid system used to determine your rating as you win or lose matches. (Example) The (change) higher rated win , means, player #1 rated 1000, defeats player #2 rated 900, 1000-900=100 pt. spread. #1 increases (+4) to 1004, and #2 goes down (-4) to 896. The (change) lower rated win , means player #1 rated 1000, defeats player #2 rated 1100, 1100-1000=100 pt. spread. #1 increases (+20) to 1020, and #2 goes down (-20) to 1080. Ratings will be updated weekly in the Club Rating tab at the top of this page. THE PING PONG PROFESSOR: Indiana native brings history, ping pong club to Sheridan. SHERIDAN — Brad Balmer loves ping pong. No, not like you love hitting back-and-forth with your brother in the basement ping pong. Balmer really loves ping pong. Balmer can even tell you why the game is called ping pong. Bruce Lee epic, vintage, legendary "Pong" video. This is unbelievable! SOUTH BEND — Tong Zhang of Clinton, Miss., outdueled Mark Hazinski to win the Men’s Open division of the St. Joe Valley Open Table Tennis Tournament Saturday at Indiana University South Bend. Hazinski, living in Plano, Texas, is a Mishawaka native. Match between Marty Reisman vs. Victor Barna. 1949 English Open. Wiff Waff, Gosima... Names have been changed to protect trademark? Check it out. Click the link below to read an article written about the SJVO that is one of the longest running tournaments in the U.S. Sheridan will one day hold events such as this. Hopefully very soon. 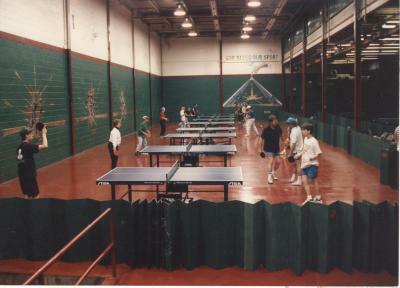 Click on the link to read about the creation of the South Bend TTC. This was an article written for the USA Table Tennis Magazine. The Sheridan Club will use this as a blueprint for it's growth. South Bends coach Dan Seemiller talks about the 52nd St Joe Valley Open. 2016 event will be held on March 12-13th at the IUSB sports facility. Entry link below. Table Tennis and Families are a great combo. 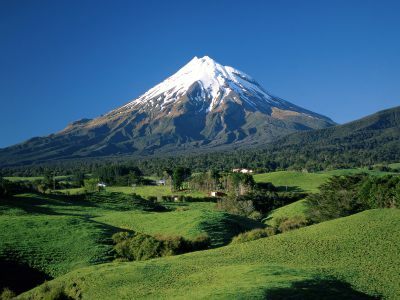 Check out this article on "Kiwi Kids."